Ohio State’s new head coach won’t be the only Ryan Day at the Rose Bowl on Jan. 1. Another Ryan Day will be watching the game from the stands – and he won’t be rooting for the Buckeyes. Search for @RyanDay on Twitter, and you won’t find the man who will soon be filling Urban Meyer’s shoes in Columbus. Instead, you’ll find a senior communications manager for Microsoft who was also once a cheerleader for Washington – Ohio State’s opponent in Pasadena – and is still a big fan of the Huskies. The Seattle-based Ryan Day first learned about his coaching counterpart in 2017, when the soon-to-be Buckeyes head coach was named the co-offensive coordinator and quarterbacks coach at Ohio State, because his best friend is an Ohio State fan. Day really started to hear more about having the same name as an Ohio State coach, though, when his namesake served as the Buckeyes’ acting head coach while Meyer was suspended this past summer. As you might expect, @RyanDay started to receive tweets from people who had mistaken him for the Ohio State coach. He’s also heard plenty of jokes from his friends about sharing a name with Ohio State’s coach, especially on Dec. 4, when Meyer announced his retirement and Ohio State announced its new head coach. Now that one Ryan Day is about to become the head coach of one of college football’s most prominent programs, the Day from the Evergreen State knows he isn’t going to stop hearing his name in the news any time soon. But he says he’s enjoying the coincidence. The less famous Day believes he and the Ohio State coach share some common traits that go beyond their names, too. Washington fan Ryan Day, his wife and two sons. As for his Twitter handle, @RyanDay said he hasn’t received any requests from Ohio State or its Day – whose Twitter handle is @ryandaytime – to give his up. If coach Day or Ohio State ever decides they are interested in getting their hands on his username, though, he says he’ll be happy to listen to what they have to offer. “We could figure something out there,” Day said. Day, who attended Washington's 2001 Rose Bowl win over Purdue as a cheerleader, will be making the trip from Seattle to Pasadena to watch his beloved Huskies play the Buckeyes on New Year’s Day, and he says he won’t hesitate to share his name with the Ohio State fans in attendance. 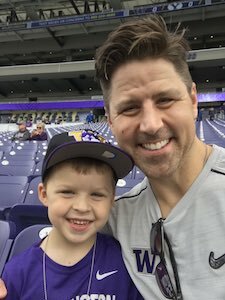 Ryan Day and his son at a Washington football game. While that last comment might not go over well with Ohio State fans, they might also find that they share some common ground. Day admitted to Eleven Warriors that he was hoping the Huskies would face Michigan in the Rose Bowl, but the reason for that is one Buckeye fans should appreciate. “I hate Michigan,” Day said. “I can’t stand Michigan. Can’t stand them. They’re the worst. I couldn’t stand them since Desmond Howard. We kicked the crap out of them in the ‘91 Rose Bowl, and I kind of wanted Michigan again just because we hate Michigan. Although he’s slightly disappointed the Huskies won’t get another chance to beat the Wolverines, he is excited to watch Ohio State play in person for the first time – specifically, for the opportunity to watch Buckeyes quarterback Dwayne Haskins and The Best Damn Band in the Land. Looking ahead, Day said he is planning to take his sons in Columbus when Washington meets Ohio State at Ohio Stadium on the back end of a home-and-home series in 2025. He’s hoping his counterpart will still be on the sidelines coaching the Buckeyes then, too.